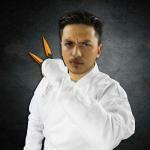 Let your ninja abilities shine with the power of the Copper Blade Kunai Ninja Sword. 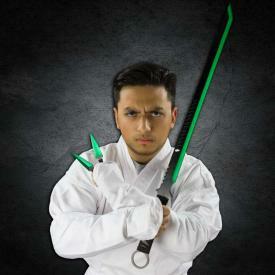 This specialized ninja weapon pack has three martial arts weapons in one. 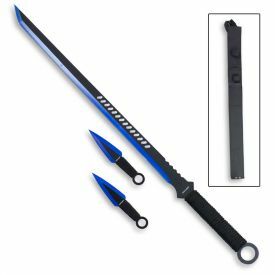 The longest and strongest weapon is the 27" full-tang sword, which is made out of hardened stainless steel and given a black and copper color to give your ninja sword a sweet straight edge. 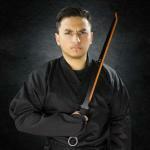 Since metal can feel uncomfortable on your hands, the copper and black ninja sword has a nylon-wrapped handle, giving you a secure and comfortable grip. With a 18" sharpened blade and steady hold, you can slice your way through any series of melee combat related challenges. Along with the copper color sword, this set includes a pair of kunai. 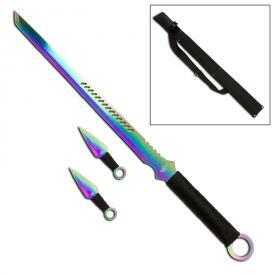 These ninja throwing weapons match the sword in having black and copper coloration, sharp blades, nylon cord wrapping over the handles, and a firm stainless steel construction. 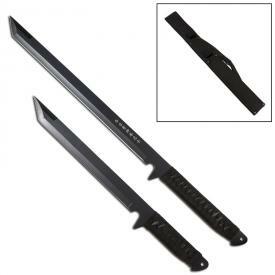 The key difference between the two kunai and the sword is that the throwing knives are only 5" long. 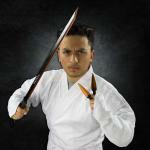 The matching sword and kunai work great as a team. You can fight off hordes of attackers with your sword and throw your kunai to distract approaching hooligans trying to flank you. The full-tang ninjato and throwers can be stored together in the nylon carrying case that you sling over your shoulder. This nylon sheath has enough pockets and sleeves to fit all three weapons. 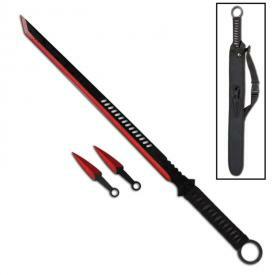 That way, you can carry this ultimate set of weapons without concerns over dropping anything or losing a kunai in your pocket.